"Modern Dadding for Modern Dads"
WAKE UP DEAD IMPERIAL STOUT by Left Hand Brewing Co.
Here’s a black ale to brighten your day. Wake Up Dead lurks in our cellars for over 4 months before being unleashed. Hints of raisins, black licorice, coffee and dark chocolate are followed by earthy, herbal hop notes. Any apprehensions about the rest of your day are quickly forgotten, for whatever the mind expects, it finds. Sometimes you’re not in the mood for what everyone else is having. 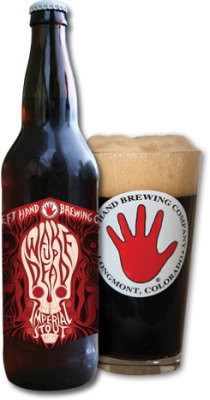 What The ClarkNova Says: Wake Up The Dead Imperial Stout is STRONG (ABV: 10.2%)! Even with the toasted malty sweetness and dark chocolate undertones it has a very smooth finish, probably due to the fairly low IBU’s. Dark and sweet (a little too sweet for my palette), with not much of a head, it is a rather heavy and slow beer to drink, but hits you like a ton of nice warm blankets. I’ve heard conflicting reports from multiple sources about whether or not drinking dark beers helps “let down” if you are breastfeeding. However, dark beers do have more flavonoids (Vitamin P) than lighter beers, and they do quickly replenish the much needed calories that women lose while breastfeeding. Here’s to you Cookiebear! Note to self: Don’t let my wife know; she might ask me to start taking turns breastfeeding the baby. P.S. to self: while pouring, be wary the “evil” lurking at the bottom of that deep, dark bottle. Note: This prestigious award will be given out every Friday to make your weekend more enjoyable! This entry was posted in Uncategorized and tagged Alcohol by volume, Baby, Beer, Beer dads, Beer Snobs, Breastfeeding, Craft beer, Craft brew, Family, Fathers, Food, Health, Home, Homebrewing, modern, modern dad, Parent, Parenting, Pregnancy, Reviews, stay-at-home dad, Staying at Home, Stout, Stress Management, Tips & Tricks by The ClarkNova. Bookmark the permalink.